It took me a bit longer than promised (life getting in the way there), but I finally made my little drawings. So now I can explain the construction of the Watteau pleat dress a little better. What I'll writing here is about making a 'latter-day Watteau pleat dress' like my own. The pleat is pretty much similar to the one on a historical dress, the rest of the dress however, is not. That said, let's move on to this half tutorial of mine. I made my dress based on my personal sloper, but what I made was a dress with armhole princess seams which is fairly fitted through chest and waist. A dress with pockets in the front side pieces, obviously. You could insert the pleat at the back into any pattern which roughly suits that describtion (if it is shaped by darts, that would be fine too. The important things are a fitted top, no horizontal waist seam at the back and a shaped center back seam and having the full shoulder line on the same pattern piece makes drafting the pleat easier). On you center back pattern piece, mark how far out on the shoulder you want the widest part of the pleat to be. 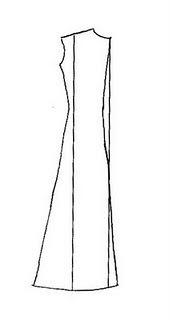 At the back seam, draw a straight line from the neck down, as shown. All the lines for the pleat will be parallel to this one. In this drawing, you can see the pleat in its full glory. 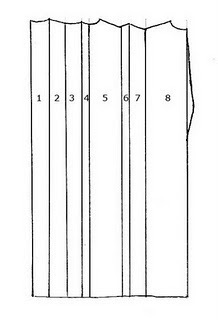 The line at piece number 1 should be placed on the fold when cutting the fabric. The easiest way to go at drafting this monster is by using something like tracing paper. Place it on your normal pattern piece, along the line you've drawn. The piece between the waist of the dress and the line should be added to the pleat pattern piece, on the 'outside' (so mirroring it over the center back line). Take care that the edge of the paper won't move away from the center back line and pull the rest to the line you marked at the shoulder. You are now making piece 8 in the drawing. This is the lowest layer of the pleat. Fold the paper back at the line and make a new line, about 4 cm from the one you came from. This is piece 7. Fold back again and go back half the width of piece 7, creating piece 6. Each line in the drawing is a fold, you have to fold 7 over 8, 6 over 7 and 5 over 6, then 4 is folded under 5, 3 under 4, 2 under 3 and 1 under 2. The width of piece 5 should be the width of piece 8 minus the width of piece 7. 5 will be the part of the pleat best visible on the outside. It's the part I made in the printed fabric. Piece 4 should be the same with as 6, 3 the same as 7. These four folds create the distinctive double folded look of the Watteau pleat. With pleat 3, you should be back at center back. The exact width of pieces 1 and 2 is not important, but they should be the same, allowing for a basic pleat at the center. When you're done folding the pleat, cut the tracing paper along the shoulder line of the original pattern piece. Or, if you prefer, make a small shoulder yoke like many historical dresses have. In any case, cut the pleat with the paper folded. In fabric the pleat should be folded just like you did in paper. Just make sure you add the 'negative' bit from the original center back line to piece 8. For the dress itself, you have to use the original center back line. When sewing the back of the dress, stitch piece 8 to center back. Then, onto piece 8 stitch the straight vertical line for the pleat from the neck till a bit below the waist. Finally, stitch center back pieces to each other (catching the seam allowance of the pleat) until the end of the straight seam. To make this tutorial a bit clearer, as requested by Cristina, I'm now adding this picture which shows how the pleats are stacked. Ignore all the vertical lines exept the 'piece between bodice and pleat' one, they're just there to make the picture understandable. I just designed the costumes for a show last Spring that featured a Watteau-pleat gown. We had decent historical patterns to go off of, but still had a hard time constructing the gown with the pleats attached. The pleats kept not hanging straight. What we finally ended up having to do was construct the gown, and construct a pleat panel separately that we then attached under a shoulder yolk, so that the pleats were a separate "cape"-like piece that hung independently of the dress and therefore stayed looking pretty. I shall have to try your method sometime and see if I have any better luck. Hi! I've found ur blog when searching for Watteau pleats, and it's been of great help! Thanx!